In simple piano exercises, you play each interval as single notes to see and hear the distance between each. But that’s not harmony. You have to play the intervals together to get harmony. 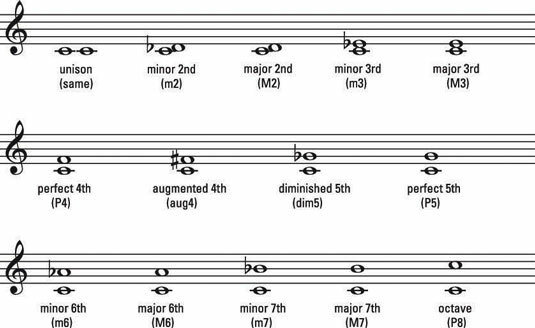 Check out each interval — perfect, diminished, augmented, major, and minor — from seconds to an octave. Try playing the notes of each interval at the same time. Notice that the notes in each interval are stacked. When two notes appear stacked, or attached to the same stem, you play them at the same time. You know, in harmony. Add intervals to the right hand under a melody line. Play intervals in the left hand while the right hand continues the melody. Adding harmonic intervals to the melody really fills out the sound. Here’s the melody of “Aura Lee” as a single-note melody in the opening phrase, followed by the same melody played with right-hand intervals added below the melody for the second phrase. As you play both phrases, listen to the difference this harmony makes. It’s not necessary for you to figure out how or when to add these intervals to a melody. The composer does that for you and notates these intervals in the printed music you play. But you should understand that all these intervals combine with the melody to make a very harmonic tune. Sure, you could just play the melody by playing only the top note of each group of notes, but your audience will appreciate the extra effort of playing the intervals. Besides, why do you think you have so many fingers? Of course, if you want to add intervals to a melody yourself, try choosing the interval either a third below or a sixth below the melody note. Take a simple melody like “Yankee Doodle” and add an interval a sixth below each right-hand melody note. You can see how this is done. Generally, stable intervals are more consonant (harmonious and agreeable), whereas unstable intervals sound more dissonant (discordant and jarring, like the Devil’s interval). One of the easiest ways to add harmony to music is to play single notes with the left hand that form intervals when combined with the right-hand melody notes. Often, you simply play one note with the left hand and hold it for several measures as you continue with the melody. Here, the right hand plays the opening phrase of “America, the Beautiful” while lefty plays single whole notes below. The harmonic intervals are simply moved an octave below, making use of the lower register of the piano and creating a nice, full sound. You can fill out the sound even more by adding a harmonic interval to the left-hand part. When the left-hand part consists of whole- and half-note rhythms, adding this interval is easy enough. The left hand plays stable, resolved intervals (thirds and fifths) except in one place: The unresolved interval of a seventh on beat 3 in measure 3 is resolved to an interval of a third to end the phrase on a more consonant harmony. Another way to go is to add a harmonic interval below the melody in the right hand, plus add a bass note in the left hand. To give a song a little more movement, you can play a harmony part in the left hand that matches the melody note-for-note. And for the ultimate in harmony, make it a four-part style with simple intervals in both hands. Just a couple of notes create a nice, full sound.